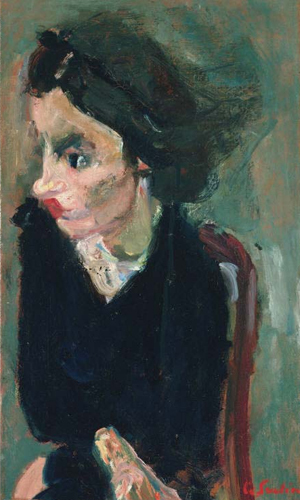 For this month’s #Phillips95 challenge, we asked you to caption Chaim Soutine’s Woman in Profile. Congrats to these three winners! “I wonder if I should listen to this entire performance or go to the bathroom now.” —Gail F.
3:01 am – …hey you, what are you up to? “I so hope Chaim doesn’t give me fish lips.” —Kristin J. “Chaim…I’m really tired of sitting here for you every day, it better be better than a Rembrandt!” —Margot K.
“I’m snowed in and there’s no chocolate in the house.” —Sharon M.
Kurtis Minder (February 16 at 2:39pm): She is irritated that she just bought an apple watch and a newer, improved model is already out.” —Kurtis M.
Interestingly, a number of people were reminded of celebrities or friends when they saw Soutine’s female sitter, including Coco Chanel, Liza Minnelli, and Judy Garland. Does this woman remind you of anyone? Thanks to everyone who participated in February’s challenge! Check back each month in 2016 for new challenges in celebration of the Phillips’s 95th anniversary and chances to win prizes.